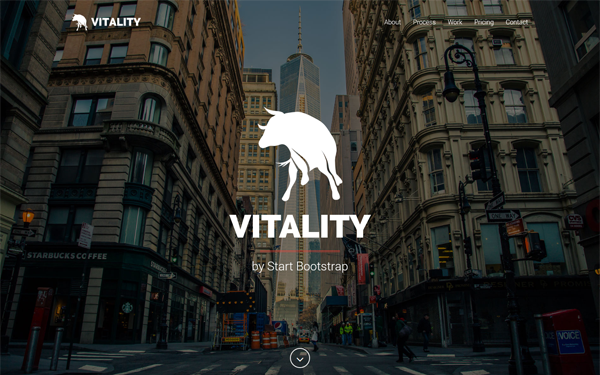 Vitality is a clean, professional, responsive Bootstrap template. With five unique page samples to get you started, this theme is perfect for a wide range of business types. New Layout - "Creative" is the newest layout added to the Vitality theme. It's perfect for personal portfolios and freelancers! New Section - A brand new, sortable Portfolio Grid is now part of the Vitality theme! New Feature - Subtle, on scroll reveal animations have been added to the theme as well! They look great, but you can disable them if you'd like! Updated Plugins - All included jQuery and CSS plugins have been updated to keep the theme fresh and current!